The 2019 General Election to elect a new National Assembly and provincial legislatures will take place amidst the sunset of the liberation struggle era. This follows the deaths of its most iconic leaders in recent years, a loss of unity within the ANC and its tripartite alliance and the damage done to its ethos or “brand” by struggle veteran Jacob Zuma. At the same time, the country’s Born-Free generation is coming of age. The Born-Frees (1) are tech-savvy millennials ranging from first-time voters to twenty-four year olds. The age profile of the national electorate is thus starting to shift as South Africa enters its post-liberation political phase. How the youth will vote in this changing era is one of the unknowns to consider when developing scenarios for the 2019 elections. Many find themselves in a highly critical frame of mind (2). This was evident in the sheer vehemence of the recent “Rhodes must fall” and the “Fees must fall” student movements. In addition, how will the ANC’s intra-party factionalism, as well as the state capture investigation and trial of Jacob Zuma, affect the party’s performance at the ballot box? Will the sixth election of its kind usher in a full term of office for President Cyril Ramaphosa, backed by a secure majority status for the ANC? Or will we see a coalition emerging from the most hotly contested national elections since 1994? And could there be any “wild card” surprises in 2019, such as a surge of support for the EFF, an election victory for the DA or a new political party linked to Vavi’s South African Federation of Trade Unions? The economic context for 2019 is that of stagnation, with GDP growth at a below-par 1.3% in 2017 and the World Bank not expecting improvement in 2018 (3), following what Trevor Manuel recently called the total disaster of Jacob Zuma’s presidency (4). There are storm clouds of high unemployment and persistent poverty gathered overhead. Public anger is in the air, especially amongst the black youth with its high rate of joblessness. Even though such conditions are conducive to the kind of Arab Spring we saw in North Africa in 2011, the pressures for revolution in South Africa are counterbalanced by several positive conditions. These positives include the cleaning up of government and parastatals led by the new President and political heavyweights like Pravin Gordhan, the maturing of democracy and the historic good will of the broader South African electorate (see analysis of Table 1 below). It’s probable that the 2019 election will be volatile but not revolutionary. Despite high youth unemployment, service delivery protests and controversial issues at play like land expropriation, there should be enough hope to pre-empt revolution in the wake of Ramaphosa’s reforms and dynamic style of leadership. At the same time, there’s a high probability of volatility, with pockets of violence, leading up to the elections. Given that SA’s economy cannot afford to stagnate any longer, and that the country is entering a post-liberation phase of history, we may view next year’s General Election as a branching point into a new future. And following the end of Zuma’s Machiavellian presidency, there’s a breath of fresh air blowing through the economy. The 2019 election results will determine the nation’s direction for the next decade. Since most social change is evolutionary in nature, occurring from within existing conditions rooted in history, the twenty-year voting patterns in Table 1 provide a point of departure for projections about voting in 2019. What this data shows is that race-based parties have failed to win widespread support in the new South Africa. Racial politics have not been palatable for the electoral majority. The IFP, the Freedom Front and the PAC have all lost support over the years, eroding to their current positions of near extinction. These three parties peaked at their first elections and then declined. By contrast, parties which endorse multiracialism, like the ANC and DA, have consistently attracted much wider support right across the country. The conclusion is inescapable: no race-based party is likely to govern South Africa in the foreseeable future. Despite headline-grabbing cases of racist citizens like Vicki Momberg, and race narratives being peddled by the Zuma faction of the ANC and the EFF, namely, scapegoating whites and white capital for social problems like poverty, South Africans are actually race-savvy. They have learnt through bitter history to be race-sensitive. A report by the Institute for Race Relations “Race Relations in South Africa: Reasons for Hope 2018 – Holding the Line” sums up the results of a poll taken in December 2017 in which 77% of black respondents said they have never personally experienced racism. About 80% of all respondents and 77% of blacks agreed that better education and more jobs would in time “make the present differences between the races steadily disappear”. Another finding was that 63% of black South Africans think race relations have improved since 1994. All in all, this survey shows that there is racial goodwill among the majority of South Africans, a finding which is entirely consistent with the results of national elections in the 1994-2014 period in which race-based parties have been completely marginalised. Although South Africa is a country with a comparatively high percentage of people who value religious beliefs, it’s clear from Table 1 that religion-based parties like the ACDP will never gain widespread national support. However, that does not mean religion is irrelevant in the country’s national elections. An electorate with strong religious leanings (5) will seek leaders who win their respect through their strong ethical integrity and statesmanship. In addition, South Africa’s civil society, heavily influenced by religious groups, has mobilised robustly against the corruption and nepotism which prevailed under the Zuma presidency. Table 1 shows that the electorate demands a multiracial political dispensation. This multiracialism is needed to underpin a social and civil order providing equality before the law. The racial goodwill evident in Table 1 has been accompanied by real social transformation during two decades of democracy. The Institute of Race Relation’s transformation audit, summed up in its January 2017 issue of Fast Facts, reveals that racial transformation of the South African workplace, asset ownership and state institutions has been significant and continues to improve (6). The clearest message of this twenty-year track record, aside from the fact that the ANC’s power peaked in 2004 at 69.69% of electoral support, is that South Africans understand the unsustainability of racism as a basis for governing the country. Nor do they wish one religion, even if it is the religion of the majority, to divide or polarise the nation in any way. A sober scepticism has taken root as evidence of a maturing democracy. Given this broad national predisposition, leaders who try to bamboozle the electorate with divisive rhetoric, will, at best, garner minority support in the 2019 elections. But we should also be aware that the future typically unfolds as a blend of history and new ideas, technologies and conditions. Just because race-based political parties failed to gain a foothold in the 1994-2014 period does not mean that they can never do so. The rise of Nazism in Germany in the 1930s shows that toxic racial ideologies can gain unexpected support under certain extreme conditions. Nor are Trump’s core supporters in the USA today famous for their tolerance of blacks, Mexicans and migrants from the Middle East. My sense, however, is that South Africa is in a state of yearning for a more efficient and equal society, rather than desperate enough to opt for the heady drug of race-based politics. The question of just how angry the unemployed Born-Frees are will determine how much support the EFF can take away from the majority who’ve voted in past elections for parties supportive of multiracialism. Another important source of analysis for foresight about the 2019 election, in addition to Table 1, is provided by the 2014 General Election result (7). From a registered voting population of 25.38 million, there was a 73.48% turnout. This compares favourably with the 66.1% turnout for the 2015 UK General election. The high turnout was another indicator that democracy is strong in South Africa. In 2014, the ANC gained 62.15% of the national vote (249 seats), attracting 11.4 million voters. The DA won 22.23% of the vote (89 seats), with just over 4 million votes. The EFF, as a newcomer, won 6.35% of the vote (25 seats), from just over 1 million voters. The other parties were also-rans, all bordering on national irrelevance. COPE, for example, lost most of the seats it had gained in its debut electoral performance in 2009, declining from 7.42% to 0.67% of the national vote. Most of these “ANC protest votes” COPE gained in 2009 went over to the EFF in 2014. In other words, the EFF ate up COPE’s market share of this breakaway protest segment of the former ANC constituency. The EFF provided a much more effective public persona and media profile than COPE, becoming the new face of protest from within the liberation struggle, even though Julius Malema himself was born five years after the Soweto riots of 1976 and COPE was founded by a respected struggle icon. What we can infer by comparing the current media profile of the EFF to its actual debut performance in the 2014 elections is that the party’s bark is much bigger than its bite. From a voting population of 25 million, the EFF built up about 1 million voters. This equates to approximately 2% of the country’s current national population. And yet this small party consistently makes the most noise in parliament and in the mass media. It is highly unlikely that the EFF’s theatrics will impress South Africa’s sceptical majority in the 2019 election. As Table 1 demonstrates, it’s not in the population’s current political DNA to base society on racism. The sober-minded character of the country’s electorate has already been noted. What we don’t yet know is if this same scepticism will be inbred in the majority of the Born-Frees. Julius Malema will be betting his political future on the Born-Free generation. In addition, as our analysis of the rise of the urban middle class will show later in this essay, the tide of future economic growth can be expected to leave behind the EFF’s twentieth century style Bolshevism. It’s probable that the EFF will occupy the small niche of liberation struggle protest voters for another term, from 2019 to 2024, and then decline into the kind of irrelevance currently experienced by the PAC, IFP and FF. I expect the party to enjoy a moderate increase of the national vote in 2019, peaking in absolute terms at between 8%-18% of South Africa’s voters, unless there a large-scale turning of the Born-Frees to the divisive EFF messages, in sharp contradistinction to the main conciliatory voting trends evident in 1994-2014. It should be remembered that in the 2016 municipal elections the EFF obtained 8.19% of the vote, up marginally from their 2014 national election result. In the more promising conditions we can expect under the leadership of an economically sophisticated President like Cyril Ramaphosa, the aggression of firebrands like Mr Malema will probably satisfy only a declining electoral niche. In Table 1, it was shown that several parties, including the IFP, COPE, the FF, the PAC and UDM, had their best elections on debut and then declined after that. Even if the EFF bucks that trend and increases its share of the vote for its second national election, the writing is on the wall for the long-term future of this radical party. The appeal of its eccentric behaviour will tend to fade over time as South Africa’s democracy continues to mature, the economy picks up, the black middle class grows and social justice becomes more widespread in the first part of the next decade. A study of the demographics driving some of the voting patterns assessed so far will strengthen the argument that the 2019 election is most likely to look like an extension of the patterns evident in the 1994-2014 period, with some minor variations. These variations, to be discussed later, will be due to the coming of age of the Born-Frees in 2019 amidst the fading power of the mythology of the liberation struggle. There’s widespread disillusionment, both inside and outside the ANC, arising from the obvious moral failures of struggle veteran Jacob Zuma during his two terms of office. Turning to South Africa’s changing demographic profile, then, what lessons can be drawn for scenarios for the 2019 election? South Africa has a growing population with a healthy balance of youth and age. It grew from 51.7 million in 2011 to 55.6 million in 2016, with 51% female and 49% male, and then increased again in 2017 to 56.5 million (8). The size of the nation’s youth cohort, aged 15-34, is a hefty 36.2%, or just over 20 million, many of whom will be eligible to vote. South Africa’s population is young compared to European, Japanese, Russian, Chinese and other populations around the world. According to UN population projections, South Africa’s young demographic profile will see its working population, in the ages 15-59, increase in relative size right up to mid-century. This trend provides another reason why creating the right conditions for economic growth now can lead to a period of increased prosperity and stability in the 2020s. The median age is expected to stay comparatively young throughout this period to reach an expected 32 years by 2050, keeping the country’s working population well-supplied and fuelling the continued rise of its black middle class. Again, these are conditions which, on the surface at least, do not favour the long-term survival of a racially biased, radical political party like the EFF. As the country enters the post-liberation phase, the mid 2020s may even see the rise of a two-party system similar the ones in the UK and USA, with the ANC being the pro-labour voice and the DA being the pro-business party. This scenario would be even more likely to happen if economic growth can increase enough to make a dent in the high unemployment rate. A failure in the next two years to create the preconditions for sustained economic growth in the 2020s, on the other hand, could precipitate an “Arab Spring” style uprising early in the next decade. The clock of history is ticking loudly in South Africa. Before we assess other demographic factors, such as the voter profiles for each of the three main parties, it should be remembered that South African politics is structured like a pyramid founded on provincial power bases. It’s important to get a sense of how influential each province is on the national stage when evaluating the total political power likely to be gained by these parties next year. In particular, one can assess the size of the provinces, their economic influence and their dominant parties. The differential between population size and contribution to GDP of each province, whether in positive or negative territory, can indicate a province’s relative economic influence. Table 2 shows that the top performing provinces are Gauteng, with a very high positive differential of +10,1%, and the Western Cape, with its more moderate positive differential of +2,3%. These provinces are the economic powerhouses of the country. Southall (2016:99) describes them as “the two wealthiest and administratively coherent provinces”. By contrast, the three underperforming provinces, relative to their population size, are the Eastern Cape, with its high negative differential of -4,9%, KZN with a negative differential of -3,9% and Limpopo with its negative differential of -3,2%. These provinces are underperforming relative to their size, whether due to high unemployment, low productivity or a combination of several factors. Six of the nine provinces, or two-thirds, have negative differentials. Naturally, there’s a correlation between provinces with the worst negative differentials and high rates of poverty. Stats SA has Limpopo with the country’s highest rates of poverty at over 75% and the Eastern Cape second with about a poverty rate over 65% (see Table 3 below). Five provinces have poverty rates around 60%, namely Mpumalanga, KZN, Northern Cape, Free State and North West. Meanwhile, the top two economic performing provinces, Gauteng and Western Cape, have poverty rates under 30%. There’s some credence to the argument that South Africa is a two-nations-in-one country, with a corresponding two-tier economy. On the one hand, there are the underperforming, more rural provinces, with below-par schooling, which supply the most migrant workers as well as the most poor people. And, and, on the other hand, the wealthy, economically dynamic provinces tend to have the best administration and education systems. When one looks at glaring economic gaps between the provinces, one concludes that South Africa is a Second World country made up of a mixture of First World and Third World conditions. The 2019 national election will reflect this reality. It should also be noted that this stark disparity between “two nations in one” provides the lifeblood to the political and economic narrative of the EFF, stoking its populism on the back of economic grievances. Such unequal economic conditions affect voting behavior in obvious ways. For example, messages of radical economic transformation will tend to resonate more among population groups and provinces mired in poverty than they would to more prosperous voter groups. For that reason, it makes sense to match voting patterns in the provinces, as at 2014, with their economic contribution to the national GDP. Since 2004, the ANC has lost the most support across the provinces. Given the pyramid structure of South Africa’s political power, this represents a significant erosion of national support. The opposite is true for the DA, growing in strength in all provinces. It now enjoys a strong national presence and brand. In the top economically performing provinces, Gauteng and the Western Cape, the DA has increased its voter share in the period 1994-2014 from 5.3% to 30.7% in Gauteng, and from 6.6% to 59.3% in the Western Cape. This represents impressive growth in political power. By contrast, the EFF’s power base lies in South Africa’s poorest province (Limpopo) and in another province with a high rate of poverty, namely North West. Both these provinces have negative differentials in Table 2. There is a marked contrast between the EFF’s strong national public profile and its shaky provincial power base. Having a power base in the poorest provinces does not augur well for the financial future of the party. The DA is clearly home to the rising middle class of all races across the country. These voters understand that the business sector plays a crucial role in job creation. While the ANC is the dominant party of our democratic history, the DA would appear to be a party with a stronger future as South Africa progresses socially, democratically, economically and educationally. All things being equal, one would expect that by no later than 2024, the DA will have become either the majority party, or the main kingmaker in a new era of coalition politics. National support for the EFF should peak, in my estimation, in 2019, bolstered by the anger of post-liberation disillusionment and disenchantment left over from the Zuma presidency, in a broader context of economic stagnation. Within these provincial power bases, it is the major metropoles which carry the most influence. It is important to get a sense of how much power the main parties have within the metropoles. This will indicate the degree of urban support which, in turn, can drive future growth of a party. 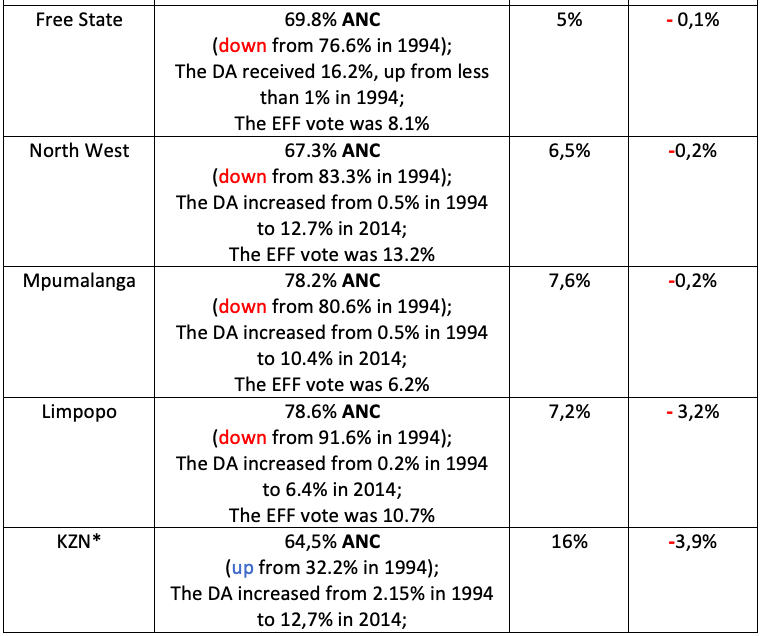 In 2016, the EFF performed weakly in the metropolitan municipalities seated in the cities of Port Elizabeth, Durban and Cape Town, while its bestresult, in the City of Tshwane metropolitan municipality, was a mere 11.63% of the vote. This once again highlights the point that the EFF is not a big player in the large urban areas of the country. By contrast, the DA’s weakestresult, in the Buffalo City metropolitan municipality, was 23.4% of the vote, twice the size of the EFF’s best result. 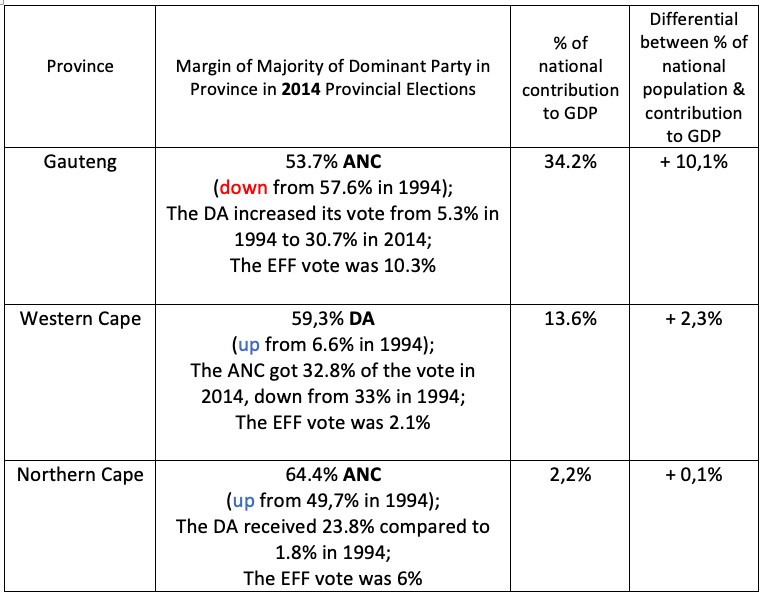 Tables 4 and 5 show that the EFF does not have a strong national appeal. It is not popular in the major metropoles. In terms of real power, it is best seen as a regional party. The DA’s best result was in Cape Town with 66.61% of the vote, compared to the ANC’s highest percentage of 58.7% (for the Buffalo City metropole). However, the ANC received the most votes in five of the eight major metropoles, including three of the largest ones, namely Johannesburg, Germiston and Durban. The DA and the ANC are strong at the base of the South African power pyramid. The same cannot be said of the EFF. That is one of the reasons why it’s voter popularity is likely to peak in the near future. The 2016 South African municipal election may be viewed as game-changing. The ANC performed so badly in these elections and pressure increased to terminate Zuma’s presidential term prematurely. Support for the ANC fell by a margin of 8.04%, from a commanding 61.95% in the previous election to a less-than-stellar 53.91%. This figure compares poorly with the party’s 65.7% share of the vote in 2006. In comparison, the DA continued the steady rise it has enjoyed for the last twenty years. It moved up to 26.9% of the vote, with just over 8 million votes, compared to its 2006 result where it gained 16.3% of the vote. The EFF trailed far behind the two main parties with 8.2% of the vote. It was what happened in the metropolitan municipalities which was ground-breaking. In a shocking reversal, the ANC lost control of Nelson Mandela Bay, Johannesburg and Tshwane, thus breaking the absolute dominance enjoyed by the party of the liberation struggle since 1994. This loss of control necessitated the formation of coalitions for some local governments. These coalitions at local level may be harbingers of future power-sharing in the National Assembly. For these reasons, the 2016 municipal elections showed conclusively that the country is entering a post-liberation political phase for the first time. Since the ANC spearheaded the liberation movement, it will need to reinvent itself to halt the erosion of support which has followed the peak of its voting popularity in 2004. In the post-liberation phase, the source of power will increasingly be from the bottom up, that is, from the metropolitan and urban centres and from provincial voter strongholds. Having assessed the role of the provinces in the changing power dynamics of the country, it would be appropriate to consider the voter profiles of the three main political parties. This will show how representational they are of the national electorate. Ipsos has provided detailed voter profiles for these parties, using a robust methodology (9). They concluded that the DA is the most multi-racial of the parties, while 96% of the ANC support base is black African, with 99% of the EFF’s support from black Africans. Table 6 shows that the EFF has a big gender problem in a country which has more females than males. This party is not particularly female-friendly. Only 33% of its voters are female. This compares to 53% for the ANC and 49% for the DA. The ANC clearly resonates with women, despite never having had a female President, as the party has 6% more female voters than males. In terms of age, the DA has a much older voter profile, with only 13% of its voters in the vital 18-24 Born-Free cohort, compared to 26% of ANC voters and a huge 44% of EFF voters. The EFF is youth-centric with very weak representation for voters 50 and above. Language-wise, the DA is poorly represented among Zulus and Xhosas, but strong in Afrikaans, English and, to a lesser extent, Sesotho. Likewise, the EFF and ANC are under-represented in Afrikaans and English-speaking South Africans. The ANC’s voter profile no longer reflects the multiracial character of South Africa’s population (10). In fact, the DA is the only party which draws support across all the main population groups in South Africa. An interesting peripheral question is whether the Venda support for the EFF (9% of its voters) will migrate to the ANC in 2019 now that Cyril Ramaphosa, born into a Venda community, is President? Among the employed, the DA is the best represented, with only 24% of its voters being unemployed, compared to 41% of ANC voters and 45% of EFF voters. When these unemployed voters get a job, will they continue to support the ANC and EFF or will some be attracted by the pro-business stance of the DA? In terms of urbanisation, the DA has appeal for urban voters. A massive slice of its voters, namely 83%, live in urban places. By contrast, half of ANC and EFF voters are rural. This is a key demographic aspect of the voter profiles. As South Africa urbanises, these rural power bases decrease in importance. The parties that are most appealing to urban voters will be the big winners in national elections from 2019 onwards. Regarding education levels, 25% of DA voters have tertiary education, compared to 10% of EFF voters and 9% of ANC voters. As these latter voters become better educated, will the attraction of the DA become stronger for them compared to the more rural parties? Geographically, the ANC has a problem in being too dependent on KZN. 22% of its voters reside in the province. As the Zuma era ends, will this provincial voter base weaken for the ANC? The ANC is also relatively light in Gauteng, with only 19% of its voters in South Africa’s mega province, compared to 35% of DA voters and 32% of EFF voters. The EFF and ANC currently have very weak representation in the Western Cape. As we have seen, the EFF has a concentrated power base in the North and is weak in the south of the country with the single exception of in the Eastern Cape. The DA has emerged as the party identified with urban social progress and multiracialism, able to resonate with educated, urban South Africans. This is the most important voter constituency of the future. That’s why I believe the DA will continue to grow its share of the national vote, as it has done over the last 20 years. As urbanisation and education levels increase, and the middle class expands, it seems that the DA will get stronger. Correspondingly, the predominantly rural parties are almost sure to decline. A scenario in which a coalition of the ANC and the EFF contests the elections in 2024 against the DA now seems possible. There is even a good chance that the DA will win a narrow national victory against this coalition in 2024. Barring any huge changes to the South African political landscape before then, the DA will probably become the ruling party well before the end of the next decade. This would be especially likely if the party builds up more support among Xhosa and Zulu speaking South Africans in the coming years. At the beginning of this century, the country had a relatively modest urban population of 56.9% of the total population. By 2030, however, this could reach over 70%. This represents urbanisation on a big scale. Conversely, the rural population will decline in importance and size to fall below 30% by the end of the next decade. According to Statistics South Africa and the World Bank, South Africa's population is currently urbanised at a rate of between 60% to 64% (11). Worldometers (www.Worldometers.info) estimates our current population to be 57 million with 62.9 % of the population being urban-based, or around 36 million (12). Statistics SA shows that after rapid, largescale urbanisation between 2001 and 2011, increasing the number of people living in urban areas by as many as 6.7 million, the urbanisation rate flattened. It may have peaked in 2018. Worldometers states that between 2000-2005, the urban population rose from 55.8 % (25.5 million) to 58.8% (28.7 million). By 2010, the rate had reached 62.1 % (32 million). Then the rate flattened, peaking at 62.8 %, before falling back down to 62.1 % (13). In other words, the country’s urban population has currently stabilised at just over 60% of the total population. Since urbanisation on the scale witnessed between 2000-2010 is socially and economically destabilising and very challenging to manage, this peaking of the urbanisation rate indicates that greater social stability is possible for the 2020s. 2018 saw the urbanisation rate stop growing for the first time since 1955. This could prove to be a demographic turning-point in the nation’s history. South Africa’s current level of urbanisation is consistent with world averages, below the rate for highly developed nations (82% rate in North America and 73% in Europe) but well above the 40% rate across Africa and 48% across developing Asia. In 2014, 54% of the total world’s population was urban. By 2050, the world as a whole is expected to be two-thirds urban, i.e. 66% (14). Looking back over the history of democratic South Africa, we can see that the country underwent two rebirths. Firstly, in 1994 the country was politically reinvented as a democratic rainbow nation. Then between 2000-2010, it was demographically transformed into an urban nation-state. The country has thus undergone two painful and destabilising periods of national change in the 1990s and 2000s. Given the current peaking of its urbanisation rate and the maturing of South African democracy, this author believes the prospects are strong that the country will experience in the 2020s its long-awaited period of social stability and more widely spread prosperity. A further source of social change in the new South Africa has been the expansion of the black middle class. This, too, is a key demographic group when it comes to understanding likely voter behaviour in 2019 and beyond. Although it is notoriously difficult to measure the size of the middle class, given different definitions of what it is, the Institute of Race Relations (IRR) believes that between 1 and 2 in 10 South Africans enjoy a middle-class standard of living. The Global Wealth Report 2015 by Credit Suisse has South Africa’s middle class at roughly the same level as the world average, namely around 14% of the population. Unilever Institute for Strategic Marketing at UCT have shown that the black middle class grew from 1.7 million in 2004 to 4.2 million in 2013 (Southall 2016:42). Southall (2016:49) argues that the basis of class in capitalist societies is occupation and that the following occupations are associated with middle class life: managers, senior officials, legislators, professionals, semi-professionals, technicians and clerks (15). Social class, in turn, depends on education levels. He shows that affirmative action policies and BEE, on the back of the Employment Equity Act of 1998, have created job opportunities for blacks in managerial positions in the public and private sectors on a large scale. Figures from the Commission for Employment Equity Report 2013-14 ( ), Tables 9,18,23 and 30 (p.76-7)indicate that black Africans account for at least two-thirds of top management at both national and provincial levels, while blacks, as a whole, compose 75% of the total workforce. Furthermore, Southall (Southall 2016:43) points out that the new black middle class in South Africa is comparatively young and “highly aspirational in terms of standards of living and hopes for their children”, as well as urban, technologically aware and well educated. Even though the ANC must take credit for pushing forward the creation of the black middle class (16), this demographic group is becoming more diverse and the party is understandably anxious about retaining its support within this upwardly mobile class. Southall (Southall 2016:50) states that the black middle class is becoming “significantly more multiracial”. He also remarks that black voters with relatively high incomes are looking to a party that will defend their middle-class status, especially as finances become tight in a stagnant, inflationary economy and financial struggles become common for households, both black and white, across the nation. This rise of a class consciousness, essentially detached from racial identity, represents an historic shift in South African demographics. For these aspiring, upwardly mobile professional blacks, black consciousness, àla Steve Biko, has been overlaid by a new class consciousness. This demographic group will be looking to a political party which will defend their hard-fought social and economic status. One example of this shift in values is how many young black families have left traditional African independent churches to join the “hip” charismatic and Pentecostal churches in South Africa’s suburbs. Southall has devoted a substantial section of his chapter of the social world of the black middle class to this social phenomenon. Some will see the DA as the home for this new class-conscious middle class. At the same time, the lower middle class may continue to find the EFF’s socialist message more appealing for as long as their economic conditions stagnate. Voter behaviour in 2019 will reflect these shifting social, class and economic conditions. As the liberation era ends, the days of ANC hegemony are over, especially in view of Zuma’s disastrous presidency and the rise of the DA as a new home for South African multiracialism. Tellingly, the ANC’s voter profile no longer fully reflects the multiracial character and beliefs of South Africa’s national population. What issues will be priorities for voters in this first phase of post-liberation politics? It has been noted that Zuma left behind an economic hiatus. This followed the stellar achievements of his predecessors, Thabo Mbeki and Nelson Mandela, in boosting living standards and lifting millions out of poverty. The economic issues will be real differentiators between the parties in 2019, unlike topics like crime where the three main parties are all equally wishy-washy, not offering the population any tangible solutions. Significantly, the OECD forecasts the beginnings of economic recovery around the time of the 2019 election: “Economic growth is projected to pick up moderately in 2018-19, as stronger activity in trading partners boosts exports. Investment will support growth in 2019 on the assumption that business confidence increases and policy uncertainty fades. Despite persistently high unemployment, private consumption will expand as wages increase moderately and food prices stabilise.” (17) Bearing in mind that the economy grew by a mere 1.3% in 2017, according to SA Stats, Trading Economics anticipates a GDP growth rate of 2.3% for Q1 in 2019, an inflation rate of 5.5% and a high youth unemployment rate of 51.84% (18). The election period is likely to take place under moderately more favourable economic and political prospects. However, the high rate of youth unemployment at 51.84% is a cause for concern and a potential base for the EFF to exploit. On the whole, the economic stagnation today is tailor-made for a Ramaphosa presidency. He is an economically literate, sophisticated man of business and labour. He seems to be a leader for the times. On the other hand, trying economic conditions, where a gap has arisen between the education system and an economy shifting more towards the services sector, creates the platform for populism, too. This is what happened in America with the rise of Trump on the back of his white-collar support in regions of America left behind by globalisation and economic change. The leaders of the three main parties, Ramaphosa, Maimane and Malema, each have the so-called “x” factor with charisma, intelligence and crowd appeal. While Ramaphosa will heal some of the deep wounds inflicted on the nation during the Zuma years, it will prove virtually impossible to undo all the damage before voters go to the polls. Trevor Manuel estimates that process will take years. This author’s view is that the electorate will focus in 2019 on policies, not on personalities, on the future of the nation, not on the past. In general, they will choose multiracialism and constitutionalism above race-based politics and political theatre. They will support policies which are likely to promote cohesion of the rainbow nation. They will also show that they cherish the country’s unique constitution. There is clearly a national desire to shake off the cloud of recent corruption (19) and to return the nation to the integrity of the constitutional democracy signed into law by President Mandela in Sharpeville on 10thDec 1996. A recent IRR poll listed ‘creating more jobs’, ‘improving education’ and ‘fighting crime’ as the three top issues for South African voters (20). This is a list which will not frighten the DA and they should be capable of putting together a strong campaign on how they would address each of these top voter issues. Given that the EFF has a weak national appeal for South African voters, as well as a fragile provincial power base, the main wild card for 2019 is not Julius Malema but Zwelinzima Vavi. Since COSATU expelled NUMSA, Vavi has mobilised a highly effective alternative called the South African Federation of Trade Unions (SAFTU). While the EFF focuses on jaded racial issues that have been out of favour with the majority of the electorate from 1994-2014, Vavi understands that the dynamic has changed to a new class conflict in South Africa where race is not the issue. It’s about jobs and the minimum wage (which SAFTU sets at R20 an hour). Highly articulate and credible, Vavi is not to be underestimated. If he were to start a new socialist party critical of the ANC and the tripartite alliance, or form an electoral pact with the EFF, that would be a big game-changer. The issue of class, largely detached from racial identity, will come to the fore on the national electoral stage. While the EFF appeals strongly to the lowest class, the poor and unemployed, there is an intense battle between the EFF, ANC-COSATU and SAFTU for the support of the working class. The DA has appealed most strongly to the middle class and upper class. This author believes this class battle will predominate in elections throughout the 2020s. 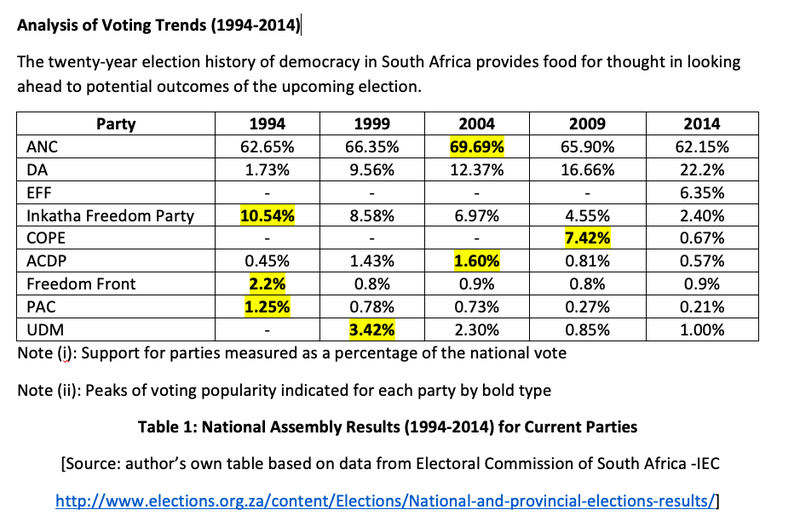 If the 2019 elections perpetuate the patterns of voting seen in the 1994-2014 period (Table 1), race will be dead as a political issue for the 2020s. This will be bad news for Mr Malema and the residual Zuma faction within the ANC. In fact, if the EFF does not reach at least 15% of the national vote in the 2019 election, its future will begin to look bleak, given that the black middle class is going to increase dramatically throughout the 2020s. On top of that, the ANC can easily absorb the more workable of the EFF’s policies. The 2019 General Election is likely to be volatile in spirit, rather than revolutionary. There is an urgent need to stimulate the conditions needed to get the country out of its suffocating sense of economic stagnation. This is needed to pre-empt the Born-Frees, with their high rate of joblessness, from turning en masseto the EFF and away from the commitment of the national electorate, evident in the 1994-2014 period, to more moderate, multiracial policies. On the whole, though, 2019 will be an issue-based election, with class politics vying with some unresolved racial issues. Each of the three main parties will need to articulate how differentiated its policies are on the top voter issues. It is expected that the ANC will attain between 45%-65% of the national vote, the DA between 20%-40% and the EFF between 5%-25%. The median of each of these ranges would give the ANC 55%, the DA 30% and the EFF 15%. My own most likely result for the 2019 elections, based on the preceding analysis, is close to these medians as follows: ANC 56%; DA 29%; EFF 11% and Others 4%. In a system of proportional representation, this forecast would give the ANC 224 seats, the DA 116 seats and the EFF 44 seats. The rest of the minor parties between them would warm the remaining 16 seats in parliament. There are broadly three main scenarios for the 2019 General Election. A “More of the Same” outcome will look similar to the 2016 municipal election results and will reflect broad trends from the 1994-2014 electoral period analysed in Table 1. I would allocate a 60% (high) probability for this scenario. A “Shake Up” outcome would see a coalition government ruling the National Assembly for the first time in South Africa’s democratic history, with the ANC forming a government only with the help of other parties, having lost its overall majority. I allocate a 35% (moderate-to-low) probability to this coalition scenario. A “Surprise” outcome would see the EFF get up to between 20%-25% of the votes, at the expense of both the ANC and DA, putting the party onto a strong trajectory of growth. I give this scenario a 15% (low) probability. Beyond 2019, one can see factors favouring a more stable social order throughout the 2020s. These conditions include a recent peaking of the urbanisation rate, which has stopped growing for the first time since 1955, the maturing of South Africa’s democracy, supported by a robust civil society, the expansion of an aspirational black middle class and more favourable economic conditions for a vigorous and youthful population. In short, it is probable that the 2020s will witness a period of relative stability and greater cohesion for South Africa. This is especially likely if the nation can decrease its stark inequalities and move from its current two-nations-in-one status to building one rainbow nation through a massive uplifting of its national education systems amidst an improving economy (21). Should this happen as expected, South Africa would gradually move towards a two-party democracy dominated by the pro-labour ANC and pro-business DA, with one minor third party agitating from the sidelines with a bellicosity rising in proportion to its decreasing relevance. The path to civic peace and economic progress for South Africa could be just one election away. (2) The New Black Middle Class in South Africa(2016) 216. (5) “South Africa is a deeply religious country: something like three-quarters of the population claim adherence to Christianity, another 10 per cent is made up of Muslims, Hindus, Jews and those belonging to other faiths, and only 15 per cent claim to have no religion.” The New Black Middle Class in South Africa(2016) 191. (6) The 17thCommission for Employment Equity Annual report, issued by the Department of Labour, shows that while whites occupy 72,0% of top management positions in the private sector, Africans occupy 73,2% of top management positions in the public sector. Africans occupy now 76,0% of the positions in local government and 74,6% in provincial government. At the semi-skilled level, Africans occupy 84,2% of positions in the public sector and 72,8% in the private sector. At the unskilled level, Africans are in the majority in all provinces and make up the majority of positions in all business sectors. See also https://www.statista.com/statistics/455931/urbanization-in-south-africa and https://www.brandsouthafrica.com/investments-immigration/economynews/south-african-cities-are-rapidly-growing “The global reputation and competitiveness of South African cities”. (12) http://www.worldometers.info/world-population/south-africa-population/- The South Africa Population (Live) counter shows a continuously updated estimate of the current population of South Africa delivered by Worldometers' RTS algorithm, which processes data collected from the United Nations Population Division. (21) South Africa urgently needs to match its education system to the changing economy. The South African economy has shifted towards a greater contribution of highly skilled jobs in the services sector and away from its traditional high dependence on mining and other sectors employing low skilled physical labour and the education sector has been left behind by this profound socio-economic shift. The IRR has done sterling work in its annual surveys and their 2018 survey reveals a growing dominance of high-skills sectors in the economy, whereas only 21% of South Africans with jobs have tertiary education (Press Release For immediate release 14 March 2018, IRR, “What South Africa needs to do to beat unemployment). Their latest survey reveals that public service provides 2 042 759 jobs, or 21% of formal employment, trade contributes 2 097 092 jobs or 22% of formal employment and finance accounts for 2 173 830 jobs or 23% of formal employment. Even though blacks make up 80% of the population, they account for only 51.4% of those having a post-school qualification, while they account for 70.7% of the population with a matric qualification. Providing free university education to students from poor households, to be funded by a higher rate of VAT, may address this critical gap in social transformation. Southall, R. 2016. The New Black Middle Class in South Africa. Johannesburg: Jacana Media (PTY) Ltd.